Final Friday Is Almost Here! CityArts is hosting the opening of three new exhibits from 5-8 p.m. on Final Friday, October 30 that celebrate the work of artists in the Wichita area. and 9 a.m.-4 p.m., Saturday. CityArts is located at 334 N. Mead in Old Town Square. The shows opening on Final Friday will be on exhibit through November 28.
please contact CityArts at 316-350-3245 or cityarts@wichita.gov. The Arts Council received a record number of entries for its 2015 Annual Juried Art Show, with more than 300 pieces of artwork submitted by 129 local and regional artists. Seventy pieces from 60 artists were selected for exhibition, including oil and acrylic paintings, photography, ceramics, glass, fiber, wooden lathe, silversmithing, kinetic sculptures and more. Recipients of the first, second and third place awards will be notified prior to the show. Winners will receive cash awards of $1,000, $750 and $250, respectively, and have ribbons placed on their pieces. 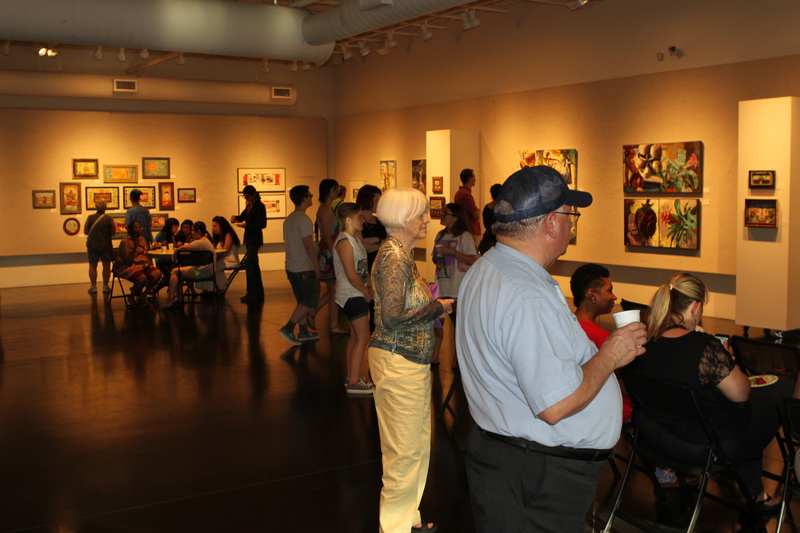 The annual juried show is open to all Kansas artists over the age of 18. This year’s juror was Brian Hinkle, who is well-known regionally as an instructor and painter of rural Kansas landscapes. He is currently represented by Reuben Saunders Gallery in Wichita, Strecker-Nelson Gallery in Manhattan, Kan. and the Leopold Gallery in Kansas City, Mo. Hinkle also teaches art classes at The Wichita Center for the Arts and the Tessera Fine Art Gallery. “Fused” is a collection that features jewelry, tiles, fuse and slump dishes, plates, wind chimes and much more. JoAn McGregor has created fused glass pieces for 10 years and owns her own studio and gallery, Blue Swallowtail Studio. Elizabeth Daniel has studied art her entire life. A graduate of Emporia State University, she has worked in different mediums, including ceramics, fiber art and acrylics. This exhibition is a continuation of a series that has been stuck inside her mind for years. In one way or another, all the pieces relate back to one theme – home. Daniel recently worked as the Youth Education Director for CityArts. Silver jewelry and custom made spheres out of rock, minerals geodes, glass and more. Sphere demo during show. Regular Hours: M-F, 9 a.m.-5 p.m. Final Friday, October 30, 6:00 – 10:00 p.m.
WSU SHIFTSPACE will be exhibiting 13, a combination of works by WSU Graduates of Studio Arts. The exhibition is curated by special guest curator Reuben Saunders of the Reuben Saunders Gallery. Artists featured include Emily Chamberlain, Jared Gabriel, Kelsy Gossett, Trishelle Jeffery, Wendi Valladares, Samantha Miller-Gott, Laura Nave, Garet Reynek, Landon Schmidt, Scott Steder, Steven White, Kristen Tripp, and Alicia Daniel. Wednesday – Saturday: 1-4 p.m. This will be Rania Dillon’s 4th exhibition for 2015 year. She is a new artist who just started to paint in March of 2015. Her talent was discovered by an art instructor and was later encouraged to give painting a shot. She has since painted several pieces and have displayed at a few different venues. She has also ventured into charcoal drawing and drawn portraits of local celebs such as Sierra Scott, Brett Harris, Melissa Scheffler, Annette Lawless, Miss Kansas 2015, as well as her favorite TV show casts from the Supernatural; Misha Collin, Jensen Ackles, and Jared Padalecki. Eric Carbrey is from Wichita and was drawn to art in the fall of 1991. A rivalry between brothers began by seeing who could better draw video game characters. Today, he creates geometric art that feels as if the shapes are growing into their current frozen positions. Carbrey strives to create complexity with simplicity and at the same time simplicity with complexity. “I enjoy being challenged by my work. I experience great delight in the physical demands of painting, and the processes of creating,” said Carbrey, who crafts his paintings by playing with opposites. “its rhythm and rhyme, up and down, a flow in and out of itself. The union of calm and chaos create harmony”. An Art for Lunch question answer session with the artist will be held Tuesday November 3 from 12 to 1p.m. in the Steckline Fine Arts Gallery. A light lunch will be served on a first-come, first-serve basis. Guests can also bring their lunch. The event is free and open to the public. Come meet and greet the artist and immerse yourself in pure color! Richard Crowson, Connie Volkman, Lyda Andrews, Sofia Fleming and other area artists showing environmental message themed works. Lawrence artist, Elizabeth Rowley, is both a plein air and studio artist. She works with oil on canvas and paper and experiments liberally with other materials – metal substrates, epoxy resins, mixed media, and spray paint. Her Bull-Mastiff, Trinity, accompanies her when she paints plein air, providing good company, a thoughtful critic, and an intimidating presence in the field.